Have you ever tried saving money for a big purchase? My husband and I are in the process right now, and it’s been quite the experience. Within the next year, we plan to add a garage and some new landscaping to our home. And while we’re thrilled about these additions (especially the garage – no more digging out our cars from under 15 inches of snow!) the process of saving enough money is a bit daunting. So to quiet these concerns, and turn our dreams into reality, Ryan and I developed a savings plan several months ago. We researched the most efficient way to save our money, while ensuring that we maintain our other financial goals as well. And after some trial and error, we’ve discovered an approach that works well for us. Because saving money is a daunting task for many people, I thought I’d share our strategy with you today. That way, the next time you have a big financial goal in sight, you can put this plan into action, and get started on the right foot. One of the most important things to know when you start saving for a big purchase is how much money you need, and whether that amount fits within your budget. So with that in mind, step one is estimating your savings goal. Admittedly, the exact cost of your product might vary over time, but getting a ballpark average is extremely helpful. It creates motivation and provides realistic expectations for when you will reach your end goal. With any big purchase, when you get an estimate, don’t stop with the first one. Be an informed shopper, and learn about the different options out there. If you’re saving for a car, for example, look into different makes and models. Consider the price difference between a “fully loaded” packages vs. the “standard” model. Think about buying a used car versus a new car etc. For Ryan and I, we first did research on which architect and home renovation company to use. During the process, we read reviews on reputable companies, and got several different estimates for the total cost, the renovation time line, and whether our plans were realistic for the allotted space. We then looked into landscaping options for replacing a wooden fence, improving the garden, and removing some overgrown hedges. And just as we did for our renovation estimates, we researched reviews and reached out to landscapers in the area for quotes. By gathering all of this information, we felt confident in making an informed and knowledgable decision. And with any big purchase, confidence in your choice is incredibly important. No one wants buyer’s remorse! So arm yourself with knowledge, read the reviews, and get several different estimates. Once you know your ballpark goal, move on to step two. Now that you know your financial goal, it’s time to create a timeline. How many months or years will it take you to save for this purchase? As you determine this information, make sure you take into account your other necessary living expenses. What is your mortgage or rent payment? How much do you spend each month on food, gas, electric, water, cable, childcare, cellphone bill, car insurance etc? By figuring out these expenditures, you’ll have a much easier time setting a realistic savings goal each month. One of the most effective ways for me to save money is to remove it from my paycheck before I even see it. And luckily, the process is quite easy; I simply set up my direct deposit to put a portion of each paycheck into savings automatically. Why automate? Why not just put the money in to savings myself? When I don’t have it, I can’t spend it. Simple as that. When saving isn’t absolutely “necessary,” it can be tempting to skim a little off the top, especially when the budget is tight. If possible, however, avoid that temptation. Remind yourself that this is temporary, and it is worth it; the more you save now, the sooner you’ll reach your goal. And that’s it! 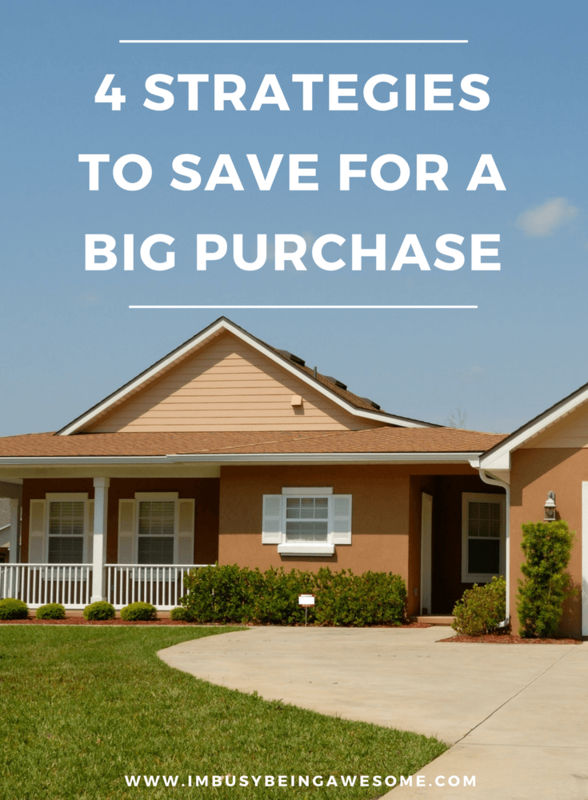 4 simple strategies to help you save for a big purchase. Figure out the cost, set a timeline, automate your savings, and treat them as a non-negotiable expense. 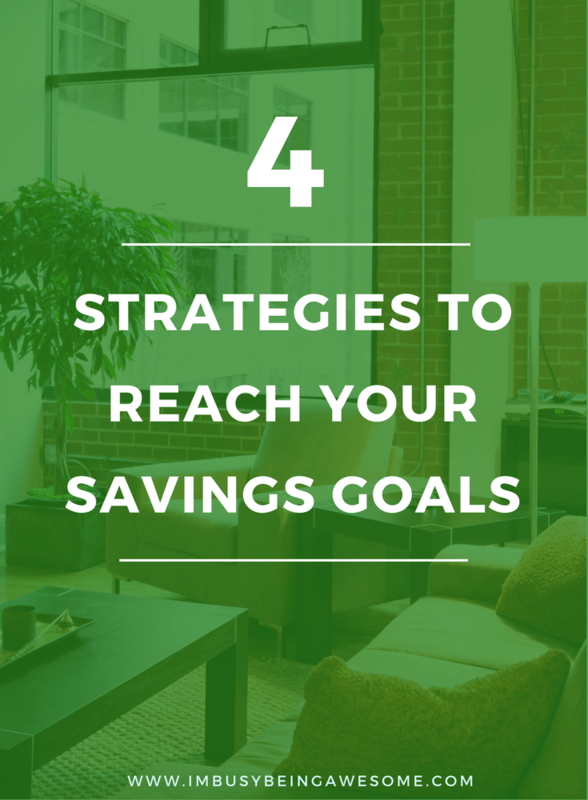 If you follow these strategies, you’ll reach your financial goals in no time. How do you save for big purchases? Have you done any home renovations? Do you automate any of your paycheck into savings? What are you saving for? Let me know below! we are wanting to build a home here in a few months which requires a lot of money upfront and im worried about extra costs that we werent anticipating!. Right now we are paying off our debts and getting rid of school loans and then save, save, save! I should do the direct deposit to savings to help out for sure! Congratulations on that next big step! And it’s great that you’re paying off the loans first. When my husband and I bought our first home about 3 years ago, there were several unseen expenses (but we didn’t build a new home). Because we budgeted some wiggle room it was okay because as you say – save save save – then it all works out 🙂 Good luck! Great tips! Treating your goals like a required expense is something I have to start doing. It makes sure you stay committed to your saving plan. I love this. I just entered into the real-world with a teaching position that pays quite well for a student with wet ink on her degree. For comfort, I live home with my mom and contribute a percentage of the rent and expenses in the home. I have no car note, and really no other responsibilities except for my phone bill. My goal is to begin saving money so that I can purchase a house (when I leave, I want to settle into my own HOME) by my twenty-fifth birthday. The main thing for me, I believe, it so automate it, because I know I won’t want to have to transfer money into a savings account every time I get paid. I have checked everything off your list, except for 1 and 4, but I will work on it. Really great tips! I like treating it like a required expense!